Samsung STAR S5233 is Full Touch screen mobile phone recently launched by samsung in India. Samsung Star comes with the latest multimedia features in a slim and compact body that measures a mere 11.9mm. Adopting a 3.0-inch WQVGA full-touch screen and Samsung’s TouchWiz User Interface with Mobile Widgets, the phone enables its users to enjoy their mobile easily and intuitively. Samsung STAR S5233 camera is 3.2 megapixel , 16:9 LCD supports hyper QWERTY keypad for upgraded ease of input, Haptic offers tangible feedback when using the touch screenAuto rotating display easily switches back and forth to optimize viewing of large content. Samsung Star supports 50MB memory capacity with an external memory slot up to 8GB. That means you can store your data upto 8 GB now don't delete songs and pictures from your phone just store. It supports multi-format and DNSe for ease of use and better sound quality. The Samsung STAR S5233 also features music recognition using Shazam’s “Find Music” service. It supports a QWERTY soft keyboard, “Gesture Lock” and handwriting feature. Samsung STAR S5233 users can enjoy full Internet browsing with an accelerometer sensor for auto-rotation. 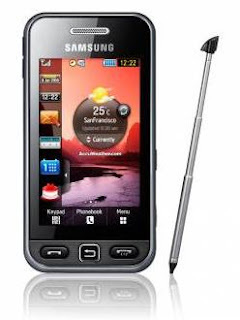 The internet functionality in Samsung Star S5230 includes email with POP3 / SMTP / IMAP4 configuration support.The connectivity on is supported with Bluetooth, WAP, USB, SyncML(DS) and PC Sync Application.The QWERTY soft keyboard with handwriting software makes sending email and sending messages a nice experience. 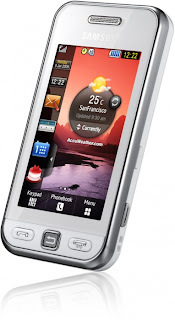 Samsung STAR S5233 is best touchscreen phone in low budget (compare to Nokia Touch screen phone). Large 3.0” LCD with 262K Color WQVGA showcases brilliance and optimized view. You will get stick with phone but there is no need of stick because i got touchscreen experience same as iphone screen. Mobile widgets customize screen with embedded widgets such as clock, scheduler, and other useful apps. In India Samsung STAR S5233 is available at Rs. 9800. This price is low compare to any touchscreen phone which having 8 GB memory and 3.2 megapixel camera. Nokia 5800 XpressMusic price is also Rs. 19,000 but compare to this phone Samsung STAR S5233 touch screen is best. * Online widgets connect you to useful info including stock updates, weather forecast, latest news, etc.. This is what my aunt bought before she came home to our place. This is a really nice phone!